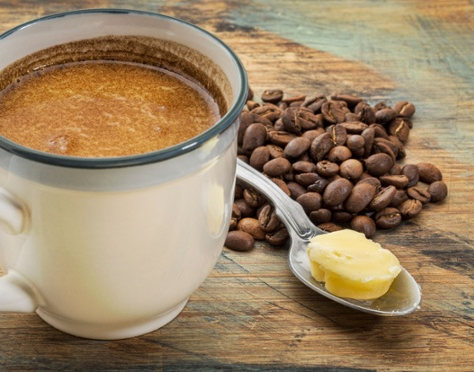 Bulletproof coffee is a bogus fad, but is it also bad for your blood lipids? You will probably have heard about the (over-)hyped "bulletproof coffee" (=coffee with butter in it) triggering measurable (and in some cases) significant increases in total and LDL cholesterol in bulletproof addicts (case studies + Toklu. 2015). Now, the most obvious trigger of the cholesterol increase is the butter you put into the coffee to make it "bulletproof". 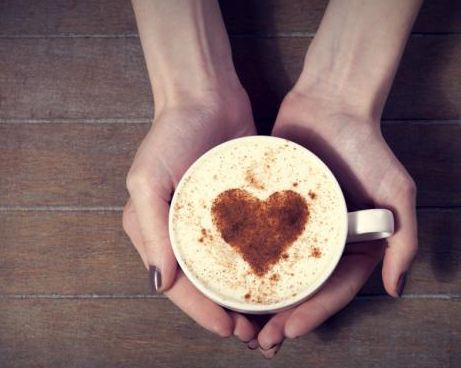 Another possible reason for the increase in cholesterol is yet the coffee itself. A reason that people apparently forgot about ever since van Dusseldorp, Marijke, et al. published their 1991 paper called the "Cholesterol-raising factor from boiled coffee does not pass a paper filter." In their study the scientists wanted to test whether filtered coffee would trigger a similarly pronounced increase in serum cholesterol, as it has previously been observed for coffee that was prepared "Scandinavian-style" by boiling ground coffee with water and decanting the fluid into a cup (Arnesen. 1984; Førde. 1985; Aro. 1987). Boiled-type coffee was prepared by pouring 0.5l of boiling water onto 25 g of coarsely ground coffee (Roodmerk, Douwe Egberts, Utrecht, The Netherlands) in an 0.5l Thermos flask. Ten minutes later, the liquid was decanted into a second Thermos flask, from which the coffee beverage was poured out into a cup or beaker just before consumption. One batch provided three cups of 0.15 l (5 fl. oz. ), prepared with 8 g of ground coffee per cup. The contents of one bottle were usually consumed within half a day, after which another bottle was prepared. Most of the coffee grounds stayed behind in the first and second Thermos bottles. Those grounds that made their way into the cup were discarded by the study subjects. Boiled and filtered coffee was prepared like the boiled coffee, but instead the liquid was poured into the second Thermos flask through a white paper filter (Melitta Nederland, Veenendaal, The Netherlands, 1x4, No. 4006508 200016) held in a conical plastic filter holder" (van Dusseldorp. 1991). Subjects in both groups were allowed to dilute the brew in the second Thermos bottle with hot water if they found it too strong for their taste. Can you do something to mitigate the effects? No, you don't have to take statins. A promising candidate would be to take 6g of taurine per day. Only 3g which is much less than the equivalent in pertinent rodent studies reduced the artherogenic index (-16% | AI is a measure that's based on the ratio of trigs to HDL) significantly and lead to slight improvements in total cholesterol levels (LDL wasn't measured | Zhang. 2004). In a rodent study, Park et al. observed a 38% reduction of LDL - significantly more than the increase that was seen in any "bulletproof coffee" case report or the boiled coffee study at hand. The caffeine content, measured by reversed phase high-performance liquid chromatography, was 860 mg/1 for the boiled and 887 mg/1 for the boiled and filtered coffee - a difference that is way too small to explain why the 0.9 l or six cups of coffee brew the subjects were instructed to prepare and drink a day had drastically different effects on the cholesterol levels of the apparently healthy, non-smoking, non-medicated, non-dieting 33 male and 33 female habitual coffee drinker (four to seven cups of regular drip-filtered coffee per day) who participated in van Dusseldorp's study. 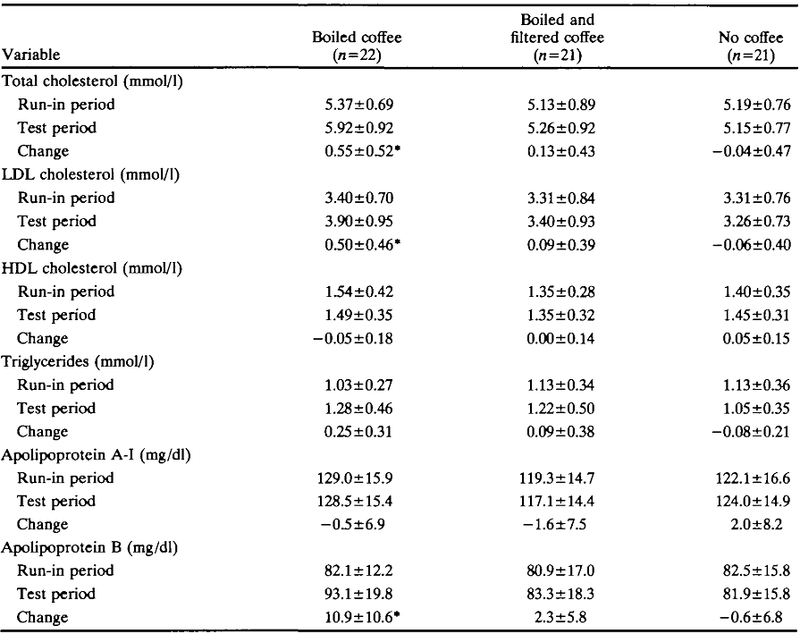 Table 1: Effects of Consuming Boiled Coffee, Boiled and Filtered Coffee, and No Coffee on Fasting Serum Lipid and LJpoprotein Levels (van Dusseldorp. 1991). With three exception, the subjects who had been randomly assigned to the boiled, filtered or no coffee groups, showed an excellent compliance to the coffee regimen and didn't change their diets (this was actually assessed) significantly over the 12-week study period. 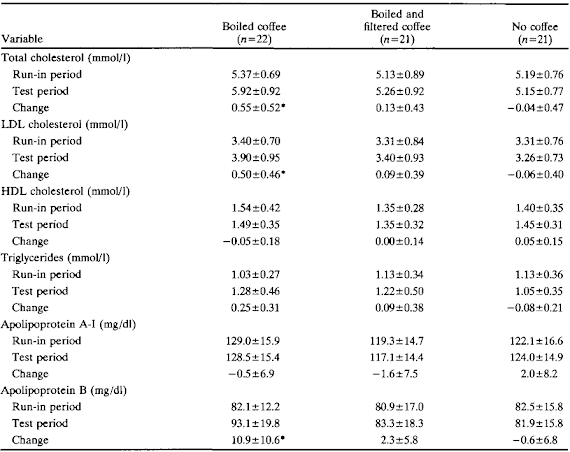 The changes you see in Table 1 are thus not a result of increased cholesterol intake as it would occur if you consume extra butter in your coffee (in fact, the subjects in the boiled coffee group consumed 4.2g cholesterol/MJ energy less during the trial, so it's not the increase in dietary cholesterol from butter). So what's causing the cholesterol increase, then? Rather than any cholesterol you put in form of butter into the coffee, van Dusseldorp et al. speculated back in the 1990s that it is the naturally occurring fats in boiled unfiltered coffee that are responsible for the cholesterol "boosting" effects. In contrast to the filtered coffee which is virtually fat fee (0.02 g/l), the boiled unfiltered coffee contains 1g/l "coffee fats". Fats of which the researchers have previously shown that they are also present in the lipid-rich supernatant of boiled coffee you can obtained after centrifugation. The same supernatant Dusseldorp et al found to trigger a 23% (!) increase in serum cholesterol (this went hand in hand with 55% increases in triglycerides). Now, since dietary triglycerides and phospholipids do not raise serum cholesterol when eaten in amounts of 1 g/day, the authors speculate that the cholesterol-raising factor makes up part of the sterol-rich fraction of the lipid. Since both, the markers of the endogenous production and absorption of cholesterol remained the same, these lipids must - in one way or another - decrease the clearance of LDL cholesterol, but as the authors rightly point out the parameters (lathosterol and campesterol) they measured are insufficient to exclude effects of boiled coffee on lipoprotein synthesis and turnover. Their findings are sufficient, however, to put a "?" behind the significance of the butter, when it comes to the ill effects of bulletproof coffee on your blood lipids... What we would have to know now, is whether the people who report increased cholesterol levels have either started to drink coffee now or increased their coffee intake from capsule machines or other methods of preparation that don't run the coffee through a filter | Comment on Facebook! Arnesen, Egil, Olav H. Førde, and Dag S. Thelle. "Coffee and serum cholesterol." 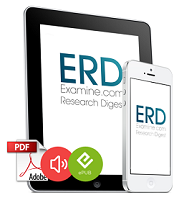 British medical journal (Clinical research ed.) 288.6435 (1984): 1960-1960. Aro, Antti, et al. "Bioled coffee increases serum low density lipoprotein concentration." Metabolism 36.11 (1987): 1027-1030. Førde, Olav Helge, et al. "The Tromsø heart study: coffee consumption and serum lipid concentrations in men with hypercholesterolaemia: an randomised intervention study." BMJ 290.6472 (1985): 893-895. Park, Taesun, Kyungshin Lee, and Youngsook Um. "Dietary taurine supplementation reduces plasma and liver cholesterol and triglyceride concentrations in rats fed a high-cholesterol diet." Nutrition research 18.9 (1998): 1559-1571. Toklu et al. "Rise in Serum Lipids After Dietary Incorporation of 'Bulletproof Coffee'." Journal of Clinical Lipidology 9.3 (2015): 462. Zhang, M., et al. "Beneficial effects of taurine on serum lipids in overweight or obese non-diabetic subjects." Amino acids 26.3 (2004): 267-271.